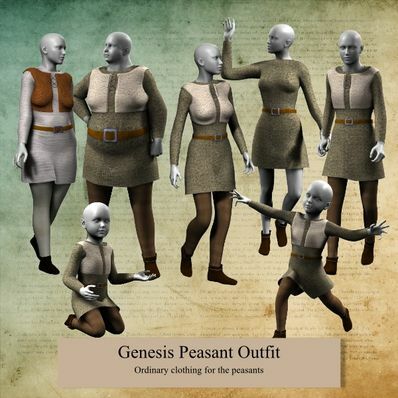 A Peasant Outfit for Genesis for use in Daz Studio 4. This outfit would be perfect for an ogre. An ogre who has layers. Like !an onion. ;) Also, it's great to have a useful outfit like this for free. Thanks for this! Any plain peasant clothes for any DAZ characters from any peiod and culture is good. There's not enough plain peasant clothes available in their store. These are great.. Thank you. Very useful - thank you so much! Oh, I needed this one! Could you add drawstring or tied pants to the outfit? Wonderful item!! Thank you, Will. Took 3 downloads for some minor background characters. I'll let you know how it works out. Thanx bunches !! Yeah, I agree, you rule at this, your stuff works out of the box. Westwind?? Gallosian?,Recluce? Kyphrian? anything from Candar? Thanks! You are great at this, can you do some Hyborian styles? Vanir, Ymirish, Cimmerian? you do have great talent! Thank you so much! This outfit reminds me of the Shrek character, nice work! All seems to be OK from this end. Can you try again? I can't download this. It says webpage not available when I click download.